Class Insecta, order Coleoptera, family Chrysomelidae, subfamily Chrysomelinae, genus Phaedon. The round prominent body of adult insect is dark green, almost black, with metallic shine. Its length varies from 3.5 to 4.5 mm. Head is drawn into the thorax; antenna is thin, moniliform, 11-segmented; first segments are red, others are black. Tylus is delimited by arched line. Elytra are covered with eight striae of small punctures and with one (sometimes two) row of punctures along lateral margin. Oval egg is light yellow (about 1 mm). Dirty yellow larvae with shining black head have four rows of dark tubercles bearing bristles. Larva length is 5.5 mm. Lemon-colored pupa (to 4 mm in length) is shining dorsally and mat ventrally. Overwintering takes place at the phase of imago in upper layer of ground, under the soil and manure lumps. 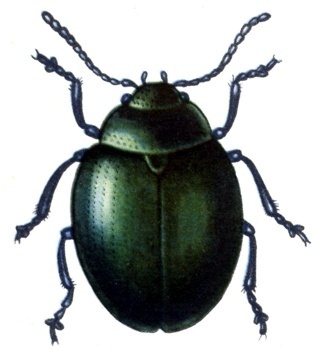 The beetles appear at the end of May and beginning of June in the northwestern and central regions; at the end of April - beginning of May in the southern regions. They start feeding on young cultural and wild crucifers. In one week the insects begin to couple, laying eggs in mid-June. Female inserts eggs into the hollows among leaf pulp or into the veins (in drop of excretions on upper and lower leaf sides). Fecundity of one female reaches 400 eggs (20 eggs during a day). Embryonal development lasts 9-10 days. At first, larvae do not move along plant, instead they eat the pulp of the "cradle". Later they crawl along the plants. During their last instar, the larvae become less mobile, leaving their host plants and pupating in the ground. The larval period lasts 16-17 (to 23) days with 3 molts. The pupa develops 8-10 days. Young beetles appear on fields during the second half of July. Total duration of insect life is 33-37 days. Hatching beetles lay their eggs in August. The insects begin overwintering at the end of October. The insect is spread in Western Europe, Anterior and Middle Asia, North America. Within the territory of the Former Soviet Union, the species occurs widely (except the Far North and the Primorskii Territory). High harmful activity is not marked. The pest is most harmful in northwestern regions of Russia, in some regions of Ukraine and Byelorussia, and in Baltic States. The pest lives openly. The most favorable conditions are air temperature 22-25°C and relative humidity 70-80%. The temperature below 15°C suppresses the development of population. The insect prefers fields with high density of plants near lakes and rivers. The sum of effective degree-days for the development of one generation is 724°C at the lower threshold 6°C. Beetles are not active in rain and wind. The species gives 1-2 generations during a year. Most important predators are Meigenia bisignata Meig., Saprinus virescens Payk., Miloralia mutabilis Fall., Morinia pullula Zett., Microbracon guttiger Wesm. The pest damages cabbage, horseradish, turnip, radish, and many wild cruciferous, such as wild radish, shepherd's purse, bittercress; cabbage is the least preferable host plant. Larvae and beetles gnaw out openings, sometimes retaining veins only. The first generation of pest is the most dangerous, feeding in June. Control measures include eradication of weeds, under-winter plowing, insecticide treatments against both imago and larvae at large population. Bogdanov-Kat'kov N.N. 1921. Mustard leaf beetle. In: Bogdanov-Kat'kov N.N., ed. Proceedings of entomological department of Nikolaev experimental station. Petrograd: Petrograd Agricultural Academy. 76 p. (in Russian). Bogdanov-Kat'kov N.N. 1921. Mustard leaf beetle. Petersburg: State publishing house. 20 p. (in Russian). Brovdii V.M. 1974. Geographical distribution and ecology of mustard leaf beetle in Ukraine. In: Vasil'ev V.P., ed. Zakhist roslin. Vol. 2. Kiev: pivdenne viddilennya Vsesoyuznoi Akademii sil'skogospodars'kikh nauk im. V.I.Lenina. P. 17-20 (in Ukrainian). Karavyanskii N.S. & Mazur O.P. 1975. Pests and diseases of fodder cultures. Moscow: Rossel'khozizdat. P. 203-204 (in Russian). Kosov V.V. & Polyakov I.Ya. 1958. Forecasting and calculation of pests and diseases on agricultural cultures. Moscow: Agricultural Department. P. 528 (in Russian). Lopatin I.K., Medvedev L.N., & Shapiro D.S. 1972. Family Chrysomelidae - leaf beetles. In: Kryzhanovskii O.L., ed. Insects and mites - pests of agricultural crops. V. 1. Leningrad: Nauka. P. 173 (in Russian). Medvedev L.N. &. Shapiro D.S. 1964. Family Chrysomelidae - leaf beetles. In: Bei-Bienko G.Ya., ed. Keys to insects of the European part of the USSR. V. 1. Moscow & Leningrad: Nauka. P. 447 (in Russian). Migulin A.A. 1983, ed. Agricultural entomology. Moscow: Kolos. P. 211 (in Russian). Polyakov I.Ya. & Tanskii V.I. 1975. The definition of economical necessity of chemical control treatments. In: Polyakov I.Ya., ed. Forecasting of pests on agricultural cultures. Leningrad: Kolos. P. 213-238 (in Russian). Shchegolev V.N. 1960. Agricultural entomology. Moscow-Leningrad: state agricultural publishing house. P. 260 (in Russian). Vanek G., Korchagin V.N. & Ter-Simonyan L.G. 1989. Atlas on diseases and pests of fruit, vegetable, berry cultures and grapes. Bratislava & Moscow: Priroda & Agropromizdat. P. 328-329 (in Russian). Vasil.ev V.P., ed. 1973. Pests of agricultural crops and forest plantations. 1. Kiev: Urozhai. P. 64 (in Russian). Volkov S.M., Zimin L.S., Rudenko D.K. & Tupenevich S.M. 1955. Atlas of pests and diseases on agricultural cultures in the Non-Black Earth zone of the European part of the USSR. Moscow & Leningrad: Sel'khozgiz. P. 160 (in Russian). Picture of Phaedon cochleariae is borrowed from the "Atlas of the pests and diseases on agricultural cultures in the Non-Black Earth zone of the European part of the USSR" (Volkov S.M. et al., 1955). Copyright is absent.